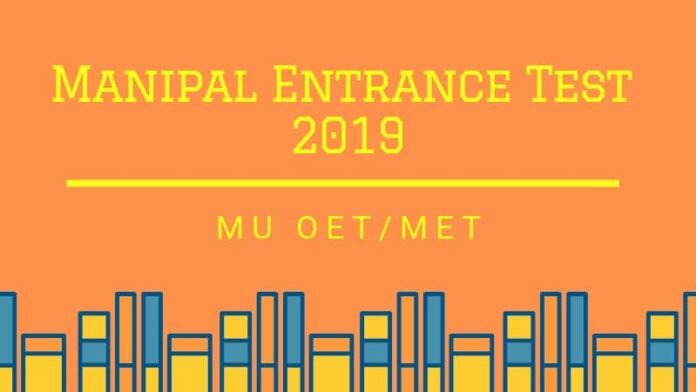 MU OET 2019 – The candidates who have taken MET 2019 can check their scores of the exam at manipal.edu. The MU OET 2019 / MET 2019 Merit List will be declared soon. Manipal University Online Entrance Test (MU OET) has been renamed to Manipal Entrance Test (MET). This is Manipal’s own entrance exam for admission in 26 UG and PG courses. 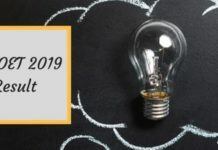 MU OET 2019 exam was held on April 19 – 24, 2019. MU OET 2019 or MET 2019 was held across 25 Indian states and at 1 international city – Dubai. Check complete details about the MU OET 2019 including the eligibility criteria, application form, syllabus, exam pattern, etc from this page. Latest: MET / MU OET 2019 Result is out now. Check here. Mu OET 2019 Result is made available online. The candidates can check their scores in the exam and the merit list is then declared based on the scores of the candidates in the exam. To check the result, the aspirants need to log in by entering the necessary login details, such as MET 2019 Application Number and the OTBS Password. As per the scores of the candidates in the entrance exam, they are placed in the merit list. Further, the candidates are called for the counselling wounds in person as per their position in the mET 2019 Merit list. Freeship scheme: Candidates getting first 100 ranks in BTech merit list in MET 2019 are offered 100% freeship. Also, candidates in the first 100 ranks of the BPharm merit list in the MET 2019 are offered 100% freeship. Next, fill in details in the MU OET 2019 Application Form like Personal Information, Educational Qualification Details, and selecting the relevant test centre. Next, the candidates have to upload the necessary images. The last stage is to make the online payment of the application fees. Note: The aspirants can apply for multiple courses in a Single MU OET Application Form only. Application Fee for MU OET 2019: To submit the MU OET 2019 Application Form, the candidates need to pay the amount as given below. Note that Manipal conducts entrance exam, not for all the courses. The candidates who have to appear in the entrance exam – MU OET, have to pay an extra amount along with the application fee towards the entrance exam fee. Mode of Payment: The candidates need to pay the above-given amount by online mode using Credit card/ Debit card/ Net banking. Lateral Entry to MIT, MLT, RT Pass with 2 years diploma in the respective domain after 10+2 from a recognized Institution / University, with minimum 50% aggregate marks or equivalent. All BTech Programs – Lateral Entry Pass in 3-year Diploma granted by the Board of Technical Examination of a State Government, with minimum 45% aggregate marks or equivalent. BPharm Pass in 10+2 examination with English as one of the subjects and Physics, Chemistry, Mathematics / Biology as optional subjects, with minimum 50% aggregate marks or equivalent. Candidates must be born on or before 31.12.2002. Post Basic BSc Nursing Pass in GNM after 10+2 or equivalent preferably with Science subjects from a recognized Board. Candidate should be a registered Nurse and registered midwife or equivalent with any State Nursing Council. After the application form is filled and submitted successfully by the candidates the slot booking starts only for the registered students. With the help of the online slot booking process, candidates get to choose their preferred exam centre in their city and also the exam date and time. Thus, the candidates get the option to select their exam date and time as per their convenience. The candidate who are unable to book their MU OET 2019 Slot, gets a slot allotted by the University. This slot might not be convenient for them, as it is as per the university’s selection. Therefore it is important that the candidate books their own slot. The slot booking window remains open for a limited period and is done in real-time and on the first-come-first-serve basis. After the slot booking event is complete the admit card is generated for all the candidates. The candidates can see that the MU OET 2019 Admit Card contains the exam city, test centre, date and time that they had selected while applying for MU OET 2019 and while doing the slot booking. Now, what is the admit card – in a nutshell, it is an exam hall ticket, without which you will not be allowed to get into the exam hall and appear in the exam. Manipal University will upload the admit card for all the candidates who have to appear in MU OET 2019 to take admission. This admit card is to be downloaded from the official website and carried to the exam centre in a printed format. This year Manipal University is conducting MU OET in the following states and cities. The candidates while filling the MU OET 2019 Application Form have to select any one of the test city as per their convenience and later dring slot booking they get to select a test centre in the selected test city. MU OET for this programme is of 120 minutes and there are 200 MCQ type questions. The marking scheme is +4 for a correct answer and -1 for every wrong answer. Diploma level Physics (10 questions), Chemistry (10 questions), Mathematics (50 questions) & Communication Skills in English (20 questions). The candidates can check the syllabus for the MU OET 2019 exam below. The syllabus is published by the University itself and it covers the details of the topics and sub-topics that are asked in the Manipal entrance test for admission in various courses at Manipal University.